The above rhyme says "baby boy = అబ్బాయి = a-bbaa-yi". You can substitute it with "baby girl = అమ్మాయి = a-mmaa-yi"
You can also substitute with the baby's name as well. Can you try practicing this substitution? This is a Telugu song on the moon - rendered by artists from all over the world. (Visit PlayingForChange.com) Enjoy! Moon (caMda maama - చందమామ) brings beautiful memories of childhoold for many. Here is a version of moon song - a lullaby parents and grand parents sing to babies. Here is another version. I will post the telugu, translation and transliterataions for the next class. O Moon! O Moon! Come to me. That king had seven sons. Those seven sons went on hunting. They caught seven fish, got them home and dried up in the sun. However, one of the fish did not dry up. raa-ju-gaa-ru, “cee-paa! cee-paa! e-M-du-ku e-M-Da-lee-du?“ a-nnaa-ru. రాజుగారు, "చేపా! చేపా! ఎందుకు ఎండలేదు?" అన్నారు. King asked "Oh Fish! Oh Fish! Why didn't you dry up?" cee-pa „“ga-DDi-moo-pu a-DDa-M va-cci-M-di” a-M-di. చేప "గడ్డిమోపు అడ్డం వచ్చింది" అంది. The fish responded "The grass bunch blocked the sun". రాజుగారు, "గడ్డిమోపా! గడ్డిమోపా!ఎందుకు అడ్డం వచ్చావు?" అని అడిగారు. King asked "Oh grass bunch! Oh grass bunch! Why did you block the sun?" The grass bunch responded "The cow did not eat me! That is why...". King asked "Oh cow! Oh cow! Why didn't you eat the grass?" aa-vu “poo-li-gaa-Du na-nnu vi-ppa-lee-du ka-daa!“ a-M-di. ఆవు "పోలిగాడు నన్ను విప్పలేదు కదా" అంది. The cow responded "The farm-hand (farm helper) did not let me free"
raa-ju-gaa-ru, “poo-li-gaa! Poo-li-gaa! aa-vu-nu e-M-du-ku vi-ppa lee-du?“ a-ni a-Di-gaa-ru. The king asked "Oh farm-hand! Oh farm-hand! Whdy didn't you let the cow free?" poo-li-gaa-Du, “a-vva naa-ku ga-M-ji poo-ya-lee-du. a-M-du-ka-ni…” a-nnaa-Du. పోలిగాడు “ అవ్వ నాకు గంజి పోయలేదు. అందుకు...." అన్నాడు. The farm-hand responded "Grandma did not feed me. That is why..."
The kind asked "Oh Grandma! Oh Grandma! Why didn't you feed the farm-hand?" Grandma responded "The baby is crying...". raa-ju-gaa-ru “paa-paa! paa-paa! e-M-du-ku ee-Du-stu-nnaa-vuu?“ a-ni a-Di-gaa-ru. King asked "Oh Baby! Oh Baby! Why are you crying?" paa-pa “cii-ma na-nnu ku-TTi-M-di-gaa. a-M-du-ku...“ a-M-di. The baby responded "An ant bit me. That is why.."
raa-ju-gaa-ru “cii-maa! cii-maa! paa-pa-nu e-M-du-ku ku-TTaa-vu?” a-ni a-Di-gaa-ru. The king asked "Oh ant! Oh ant! Why did you bite the baby?" Then that small ant shouted "if someone pokes a finger into my golden house, why would I keep quiet?" When the ant shouted very loudly, the king's ears went deaf. That is the story my dear children! Story goes to 'Kanchi'.. and we go home. And I am posting the same video of consonant blends here. (a) Match the US States (English to Telugu): On a separate paper, match the numbers. 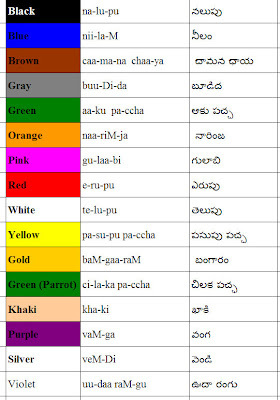 (b) For each state written in Telugu, put a X mark in the column if you identify one of the following.